The U.S. Center for Disease Control and Prevention has concluded, "handwashing is the single most important means of preventing the spread of infection." It has been proven that handwashing is vital for everything from preventing the spread of germs that cause respiratory illnesses to preventing serious and even fatal bacterial infections. A number of serious diseases and infections could be prevented with proper handwashing including Influenza, E.coli, salmonella, meningitis, and certain gastrointestinal infections. You cannot see the pathogens that cause illnesses and the only way to fight them is to wash your hands properly and often. For proper hygiene it is recommended to have a minimum of one (1) hand washing station per 4 restrooms. Handwashing is a critical element in proper hygiene as germs can stay alive on hands for up to three hours! 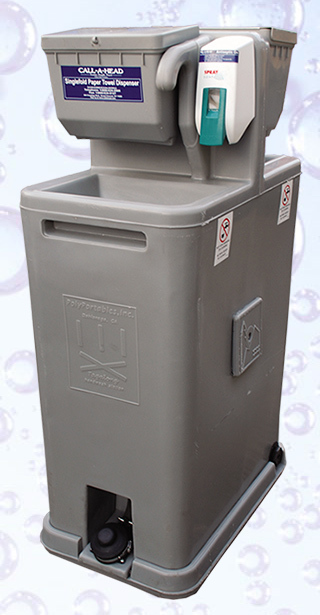 CALLAHEAD offers the largest variety of portable hand washing sink systems in order to increase good hygiene and safety at job sites and special events of every size and location. The ROLLERSINK, our single user handwashing sink system on wheels, is ideal when space is limited or easy mobility is required. 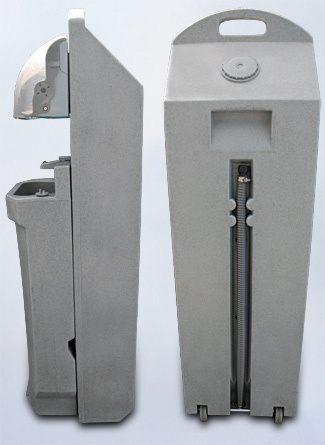 The compact design allows the ROLLERSINK to be used almost anywhere handwashing facilities are desired or required. The ROLLERSINK has all the amenities of our larger sink systems including a soap dispenser, single fold paper towel dispenser and hand-free foot pump operation, yet is small enough for tight spaces or hard to access areas. With separate fresh and gray water tanks you're rest assured of hygienic protection and no gray water contamination. The ROLLERSINK is easily transported with its built in handle at the top and lightweight rubber tread wheels; maneuvering it is similar to a hand truck. Measuring only 18" wide and 62" in height the ROLLERSINK will fit easily in doorways, elevators, high-rise buildings, houses, cellars, garages, backyards, basements, on top of roofs, docks, through narrow alleys, gates and hallways and just about any other remote location requiring handwashing capabilities. CALLAHEAD realizes handwashing isn't just a simple matter of cleaning your hands of dust, dirt, and grime; but it is one of the most important steps you can take in preventing the spread of infection, helping to keep yourself and those around you healthy. Our goal is to ensure every customer can make certain their job site or special event has the portable sink they require to protect themselves from bacteria and illness, because we care. For guaranteed sanitation, superior quality, exceptional service and the largest variety, call CALLAHEAD today for your portable sink needs.